Last week, the White House claimed that the Syrian Army was preparing a chemical attack. According to political analyst Yury Zinin, the US is looking for a pretext to stop the advances of the Syrian Army. "The United States has identified potential preparations for another chemical weapons attack by the Assad regime that would likely result in the mass murder of civilians, including innocent children. The activities are similar to preparations the regime made before its April 4, 2017 chemical weapons attack," the White House said in a statement. Washington also warned that Syrian President Bashar Assad and the Syrian military "will pay a heavy price" if such an attack is carried out. Commenting on the statement, Kremlin spokesperson Dmitry Peskov called it baseless. "We heard about this statement. We do not know what the basis is. And of course we categorically disagree with the 'another attack' wording," Peskov told journalists. 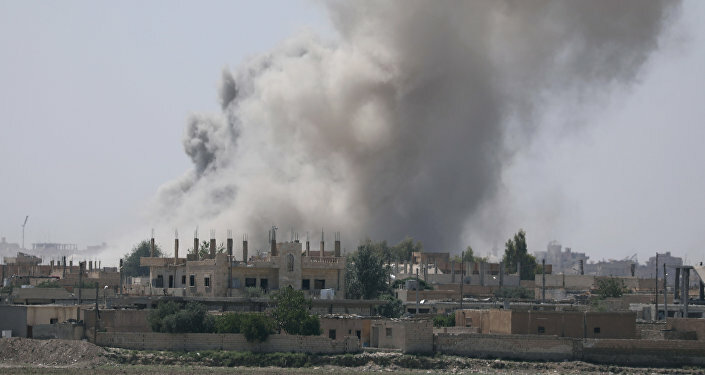 Yury Zinin, an expert in Middle East studies and senior fellow at the Moscow State Institute of International Relations (MGIMO), suggested that policymakers in Washington are concerned over Syrian military’s recent advances against terrorists. "Apparently, they just can’t let it go. They just can’t stop looking for a pretext to stop the growing influence of the Syrian Army. Evidently, there is no other way but imputing [such plans] to Damascus. This is what behind their bogus stories," Zinin said in an interview with Radio Sputnik. The expert suggested that Washington hopes to "impose its own scenario" on Damascus before Daesh is completely defeated. "Moreover, Iraqi forces are advancing against terrorists and nearing the border with Syria. This is a major achievement. As soon as both countries restore control over the border a decisive blow will be delivered to Daesh, including to its capability to maneuver and move forces between the two countries," Zinin concluded. On April 4, the National Coalition for Syrian Revolutionary and Opposition Forces supported by the US blamed the Syrian government for an alleged chemical weapons attack in Khan Sheikhoun in Idlib province. In response to the incident, Washington, which had not presented any proof of the chemical weapons use by Damascus, launched 59 Tomahawk cruise missiles at a Syrian governmental military airfield in Ash Sha’irat on April 6. Damascus has repeatedly denied any involvement in the incident and said that the Syrian government doesn't possess chemical weapons as the full destruction of Damascus’ chemical weapons stockpile had been confirmed by the OPCW in January 2016.